The current Fleetwood Mac guitarist rocks out with his "two brothers from another mother." The two songs will appear on the singer and guitarist's forthcoming ‘Solo Anthology,’ out October 5. Rush's sound and style influenced rock and blues artists from Eric Clapton to Stevie Ray Vaughan to Jimmy Page. The 3-CD release gathers music from the band's half-century career. The revamped band, with Tom Petty & the Heartbreakers' Mike Campbell and Crowded House's Neil Finn, played "The Chain" and "Gypsy." The classic Fleetwood Mac lineup always was an odd bunch. 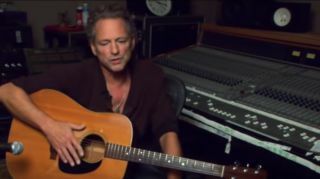 On April 11, Fleetwood Mac'sLindsey Buckingham and Christine McVie announced they'd be coming out with Lindsey Buckingham/Christine McVie,their first album as a duo,on June 9. Lindsey Buckingham and Christine McVie, longtime members of Fleetwood Mac, have teamed up to record their first-ever album as a duo.